Why Are Prospective Longitudinal Studies Needed in Preterm Behavioral Epigenetic Research? To the Editor In an article published in JAMA Pediatrics, Saigal and colleagues1 report findings from a praiseworthy longitudinal research study on the adulthood outcomes of extremely low-birth-weight individuals. Even controlling for neurosensory impairments, they document that extremely low-birth-weight individuals had detrimental sequelae at several domains of physical, behavioral, and psychological functioning when compared with normal-birth-weight term control individuals. These findings are highly relevant because they provide a unique perspective on the long-term life-course development of extremely low-birth-weight individuals who happened to be born prematurely after the introduction of neonatal intensive care units (NICUs). 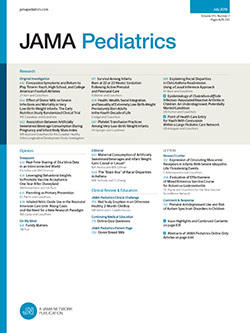 Whereas these findings highlight the need of dedicated lifelong support and continuity of care for extremely low-birth-weight individuals, open questions still remain about the causes of such a heightened risk of chronic health problems, and one might wonder whether extreme prematurity itself and/or environmental conditions related to NICU hospitalization might play a role. Indeed, during a critically sensitive period for brain neuroplasticity, extremely low-birth-weight individuals are exposed to a medicalized and technological environment that is far from being a surrogate of the maternal womb and that is highly stressful for the very preterm human newborn. Studies suggest that the exposure to precocious adverse experiences are able to program the risk of later-in-life chronic health conditions.2 At least partially, this early programming of health and disease is owing to epigenetic processes, such as DNA methylation, that can reduce the transcriptional functionality of genes without modifications of the DNA sequence (ie, gene silencing). In very preterm infants, the number of life-saving yet painful and invasive procedures during the NICU stay have been linked to higher DNA methylation of the serotonin transporter gene (ie, SLC6A4) at NICU discharge.3 Notably, higher rates of SLC6A4 methylation have been found to be predictive of temperamental difficulties at 3 months of life4 and internalizing behavior problems at school age5 in prematurely born children. Although it is still at its beginning, the application of epigenetic research to the field of prematurity holds the promise of revealing the biochemical pathways bridging the gap between early stress and the programming of health and disease during later life. We suggest that longitudinal and prospective studies looking at the effects of early NICU-related stress on behavioral, emotional, and neurological development should be pursued in forthcoming years to deepen our understanding of the pathways leading to heightened risk for adverse developmental outcomes in very preterm infants.